Astrophysics is truly one of the rarities in the physical sciences, as it has managed to branch between hard academia and the general public like no other in our modern technological age (Nova and PBS Specials, The Discovery Channel, and Big Bang Theory alike). The proof is in the cosmic pudding – unlike most any other branch of science, I can tell you that “one of the world’s most famous astrophysicists is coming to give a lecture in Syracuse” and you’re likely asking yourself “Neil DeGrass Tyson? Brian Cox? Stephen Hawking?” Try putting a name list together in any other field! It is with that analysis in mind that I’m forwarding here an announcement from the TACNY email listserve about the “NEXT: The Event for Technology, Manufacturing & Innovation” conference happening this coming Tuesday, November 19th at the Holiday Inn Syracuse-Liverpool. The event, sponsored by the Central New York Technology Development Organization (TDO) and the CASE Center on the Syracuse University campus, features two keynote speakers. The first, “Making it in America – Shifting Economics Create New Opportunities,” is by Harry Moser of The Reshoring Initiative. The second, perhaps more relevant to readers of the blog, is none other than Hayden Planetarium directory and all-around exponent of science Neil deGrasse Tyson. Come. Be Inspired. Leave Smarter. “Making it in America – Shifting Economics Create New Opportunities” – The morning keynote, Harry Moser, President/Founder of the Reshoring Initiative, will discuss the broad resurgence of American manufacturing. Delivering insights into the trend, what types of products are leading the charge, and what the new American manufacturing industry might look like. “Reaching for the Stars” – The luncheon keynote speaker, Neil deGrasse Tyson, is an internationally renowned astrophysicist, science policy advisor, media personality and Frederick P. Rose Director of the Hayden Planetarium. He will explore the state of science literacy in America today and the critical importance of continued government and industry investment in fundamental scientific research for the long-term economic health of the country. So many of the technologies and products we take for granted, from freeze drying to scratch-resistant lenses to solar cells, are a direct result of research done during the “space race” in the ’50s thru ’70s. No one knows where the next breakthrough discovery will come from! Join astrophysicist Neil deGrasse Tyson as he explores the state of science literacy in America today and the critical importance of continued government and industry investment in fundamental scientific research for the long-term economic health of the country. What is the short- and long-term future of the aerospace industry, and how will that future impact the broader economy, and our day to day lives? Only by reaching for the stars, continuing to explore every aspect of the world and the universe, can we build a solid foundation for the next generation’s industry and economy. Speaker Bio: Neil deGrasse Tyson, the Frederick P. Rose Director of the Hayden Planetarium, is an internationally renowned astrophysicist, science policy advisor, and media personality. A thought-leader in science and technology, Dr. Tyson has served on Presidential commissions on the future of the US Aerospace Industry and continues to serve on NASA’s Advisory Council. He has received eighteen honorary doctorates and the NASA Distinguished Public Service Medal, the highest award given by NASA to a non-government citizen. He has written countless professional papers as well as ten books, including New York Times bestseller Death By Black Hole and Other Cosmic Quandaries, The Pluto Files: The Rise and Fall of America’s Favorite Planet, and The Sky is Not the Limit: Adventures of an Urban Astrophysicist. Among his many television and media appearances, he hosted PBS-NOVA’s mini-series Origins, the NSF-funded pilot radio program StarTalk, and is currently working on a 21st century reboot of Carl Sagan’s landmark television series COSMOS, to air in 2014. Tyson was voted Sexiest Astrophysicist Alive by People Magazine in 2000. While the Night Sky is always inspiring, it is quite… constant. The positions of objects within our own Solar System change with respect to the background of stars, weather patterns on Jupiter and Saturn can produce a bit of variety for backyard telescopes, Iridium flares and other satellites produce some nice bursts of reflected sunlight, the Sun can prove to be a many-varied treat to afternoon solar watchers, and the most astute observers can pick out the differences in brightness of variable stars. That said, much of the rest of the Night Sky only changes due to the rotation of the Earth about its axis and the revolution of the Earth around the Sun (within the lifetimes of most observers, that is). Significant changes to stars, nebulae, and galaxies can take decades, lifetimes, or eons, meaning even many observers take in the same deep sky views throughout their entire lives. The recent nova in Delphinus was then noteworthy as something that (1) changed dramatically over the course of days and (2) occurred within our own Milky Way galaxy. CNYO members held their first Scope Mob at Jamesville Beach to take in a prime view of the nova from just outside Syracuse, finding a quite reasonable spot for future sessions at the same time. With several excellent websites providing great detail on the nova itself (I specifically direct you to universetoday.com, space.com, and AstroBob’s article (link HERE), which I count as the most thorough article written on the event), a group of astronomers have provided an official measurement of the distance to Nova Del 2013, posted to Astronomers Telegram on 23 August. In their report, they determine that the nova is 4.2 kiloparsecs (I refer you to the wikipedia article on the parsec for more info), or about 13,700 light years, away. As our own galaxy is about 100,000 light years across and we’re about 25,000 light years from the center, this puts the nova in our own celestial neighborhood. That said, this means the nova itself occurred near the end of Beringia, the land at the bottom of the Bering Strait, after the last great ice retreat but before the flooding that separated Asia from America (so it’s been a while, but an eye blink in celestial terms). … So the distance of the nova is d ~ 4.2 +/- 0.4 kpc Using the linear Mv-log(t2) relation of Downes & Duerbeck (2000, AJ 120, p.2007) a t2 = 8.5 implies an absolute magnitude of Mv ~ -8.9 +/- 0.2. So, ceteris paribus, the distance changes to d ~ 3.5 +/- 0.4 kpc. As a final preliminary estimate, we can adopt a value around 4 kpc (or a bit less) for the distance of the nova DEL 2013. 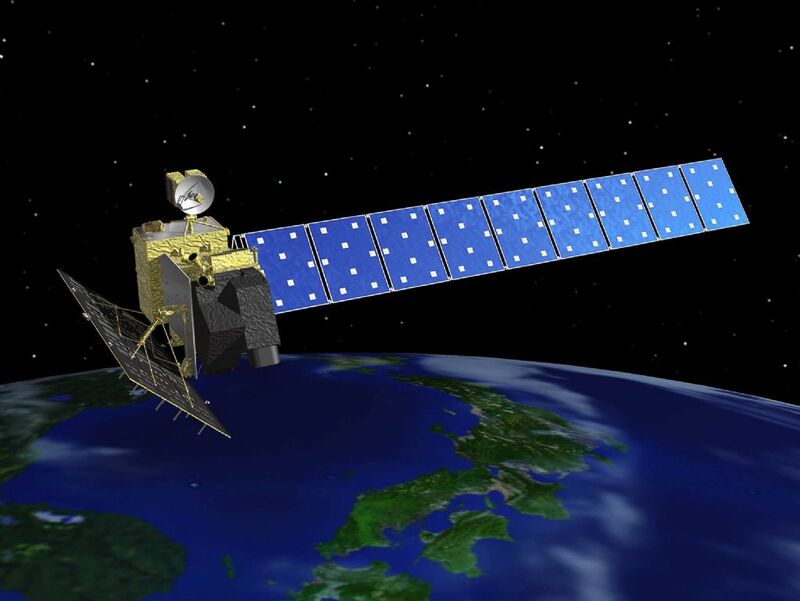 DAICHI (ALOS) – See space.com for details. For those wanting to check out the nova themselves in the next few days, I am pleased to report that it is presently Naked Eye (so is markedly brighter than it was even last night – 5.0 and brightening by all reports). For those interested in the search, I provide unlabeled and labeled images below. 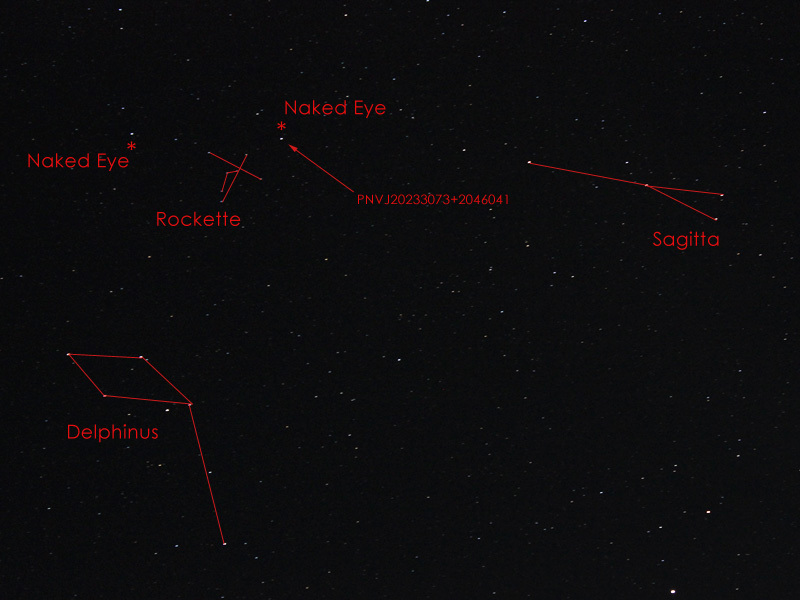 The key is to find the brighter Delphinus (look below Cygnus for the medium-bright diamond shape), then find Sagitta above and to the right (looks like a dim arrow). Naked Eye, you will see a star above Delphinus’ head, then another one between this bright star and the arrow tip of Sagitta. That “other” star is the nova, likely set to be even brighter tomorrow (with a closer Moon but still clear predicted skies). If you’re using 7x to 25x binoculars, you will see a small cluster of stars to the lower-left of the nova – which I’ve connected in the form of a Rockette for what may or may not be an obvious reason. 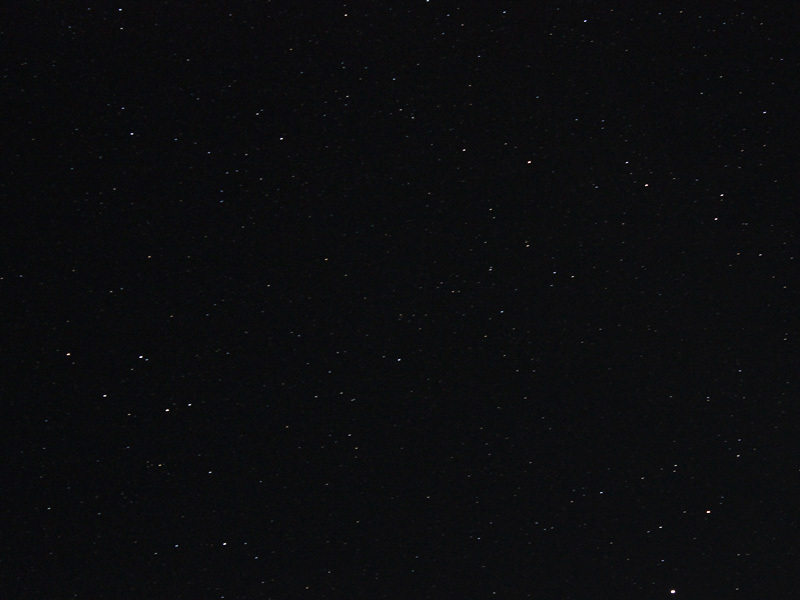 Unmarked image (Canon T3i, 13 sec. exposure, ISO 1600). Click for a larger view. Marked image (Canon T3i, 13 sec. exposure, ISO 1600). Click for a larger view. But it’s a relatively easy find once you have Delphinus and Sagitta figured out. There are only two other bright starts in the vicinity!